Bright Line Eating, Menu and Checking In – What's for dinner, Doc? The Verdict is In; Bright Line Eating is working for me. I feel great and I’m almost off sugar and flour without much effort. I started Bright Line Eating in earnest on January 1st and I’ve lost 7 pounds! This really doesn’t feel like a New Year’s resolution, it’s more of a healthy adjustment. 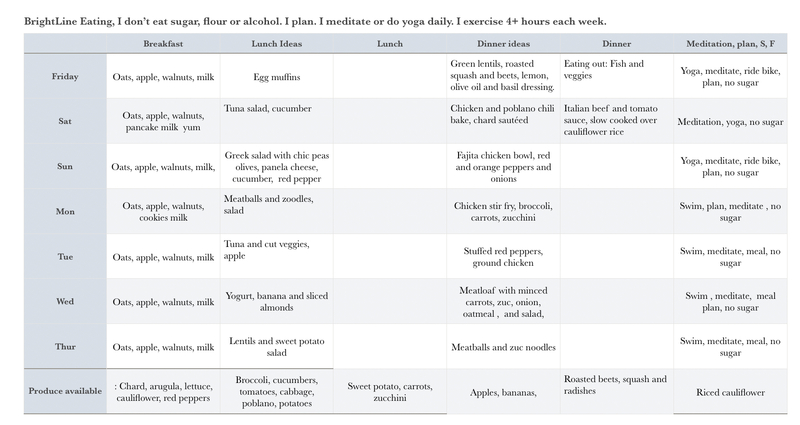 The eating plan isn’t vastly different from how I usually eat with the exception of eating no flour, sugar or alcohol. The weight loss phase is relatively low carbohydrate with an abundance of vegetables. I am eating 3 meals a day, I have cut out all snacking and I’m fasting from 6pm to 8am every night. I think closing the kitchen and brushing my teeth immediately after dinner has been reducing my unintended calorie consumption by 300-400 calories a day. In my opinion South Beach diet allows way too many snacks and desserts. I didn’t love all of the fat, protein and artificial sweeteners. The diet never allowed me to quit craving sugar. Artificial sweeteners increase sugar cravings in the brain so BLE doesn’t allow them. Try this little experiment. Write down everything you eat after dinner and calculate the calories you would save with that change alone. Yes, I often go to bed hungry and no it won’t kill me. The data on intermittent fasting is compelling. It reduces inflammation and allows the body time to repair itself in a resting state. It reduces insulin levels allowing the cells to release fat for fuel. It makes sense to me. If you’re constantly grazing and going to bed with a stomach full of junk food, how can you expect your body to heal and repair itself? This week I have an abundance of produce from the CSA so I washed and prepped several vegetables for easy mix and match meals. I roasted beets, radishes and squash. I washed all of my lettuce and arugula for salads. I washed and riced a head of cauliflower for quick fried “rice” and a polenta substitute. I washed chard, kale and beet greens for a quick sauté with garlic and olive oil. I cooked a batch of green lentils and chic peas for vegetarian protein. I cooked an Italian seasoned beef and tomato sauce with lots of mushrooms and herbs to be served over zucchini noodles or cauliflower polenta. I made mini egg frittatas with egg, cheese and chard. I make my meatloaf with lean ground chicken, turkey or beef but include 1/3 vegetables by weight. Minced onion, carrots, zucchini, mild chili peppers, spinach or chard are all good options. If your vegetables are ready it is easy to grill or bake your protein serving or throw in legumes for a vegetarian/vegan option. Here’s this week’s suggested menu, my list of available produce and my personal self-care plan with exercise and meditation commitments. I fill in the chosen meals for the next day in the evening depending on what sounds good and I make a concerted effort to eat what I planned to eat. Here are a few photos from La Paz, BCS, Mexico. La Paz is a 5 hour drive south of Loreto and 2 hours north of Cabo San Lucas. It reminds us of Cabo in the old days. It’s a great place to vacation and it’s easy to get there from LAX or Tijuana / San Diego. Tracey, your menu prep and plan is brilliant. I do love spiralized zucchini but need to find out how to rice cauliflower. The after six stop eating thing is huge but your success is inspiring! Thank you. I rice the cauliflower by running it through the grater on my food processor. You can use the cutting blade too but it’s difficult to get an even chop. Grating by hand is messy but it could be done. I couldnt agree more with the benefits of intermittent fasting. My husband is reading a book called The Circadian Code – sounds like you’d love it too based on this post. I need to learn from you and brush my teeth after dinner – my post dinner dark chocolate fix means I need to fast until 11am the following day!! There is some interesting data on intermittent fasting for brain health and reducing dementia. Sleep is really important too in maintaining a normal circadian rythmn..